The Luminaries is set in the gold rush region of New Zealand’s west coast, circa 1866. At its core, it’s a murder mystery that hinges on secrets kept and secrets shared among its characters, which include earnest young men and jaded “professionals”—hotelier, shipping agent, journalist, clerk, madam. The novel won its author, Eleanor Catton, the 2013 Man Booker Prize and at 830 pages is the longest-ever novel to garner that award. The book’s sheer length and its organization through astrological motifs felt a bit daunting, I admit. But once I plunged in, I was captivated by Eleanor Catton’s confident, if somewhat archly, “traditional” voice and her skill in setting a scene and introducing characters. The clock had struck that late hour of twilight when all colors seem suddenly to lose their richness, and it was raining hard; through the cockled glass the yard was bleached and fading. Inside, the spirit lamps had not yet succeeded the sea-colored light of the dying day, and seemed by virtue of their paleness to accent the general cheerlessness of the room’s decor. In one way, Walter is correct: this is indeed a strange new land, populated almost entirely by men, almost entirely from somewhere other than New Zealand. But Walter is also mistaken, because the most ancient patterns of all—ambition, pride, jealousy, greed, lust, obsession—are all in evidence in this gold rush town. Here are stories upon stories and within stories, tossed among characters, flung backward and forward in time, organized according to Catton’s elaborate astral scheme. I chose not to obsess over the zodiacal elements, however. To be honest, I was too caught up in reading, reading, reading. 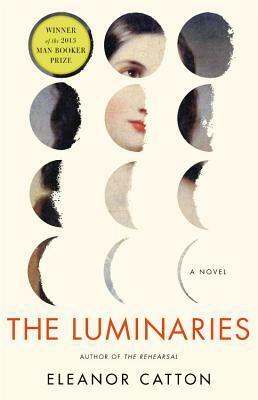 There is a lot to admire and enjoy in The Luminaries, and I’m glad I read it. But I don’t think it ultimately delivers on its promise. Even in all its variety, the core story isn’t quite grand enough or affecting enough to justify its self-conscious organization or its length.